Water is the essence of life on this planet and every living creature cannot survive without it. So it’s really easy to understand why water for diabetes is crucial because it is even more essential for people with diabetes, both type 1 and type 2. It’s especially important for folks with diabetes but of course absolutely essential for every human being and living creature on the planet to survive. So why is it absolutely essential? We die without water and with diabetes not having enough water will just speed up the dying process. Water plays a huge role in maintaining metabolic processes, the pH balance of your body, getting rid of waste products, and providing products that are useful for the body. It does this while performing the functions of all of your major organs at the same time. So your question is most likely, ” Can drinking a lot of water help to lower my blood sugar?” The answer beyond a shadow of a doubt is YES! Water helps you to lose weight because it suppresses your appetite will reduce your resistance of insulin. So the basic answer to how much water you should drink is 6-8 glasses (8 ounce) daily. I’m sure that you’ve heard this many times before. It’s important because you need this much water in your body especially with diabetes, but you do not want to drink TOO much and cause water intoxication which we’ll get into later. The basic 8 glasses is sufficient to lower your blood sugar levels and take care of that hunger pain. 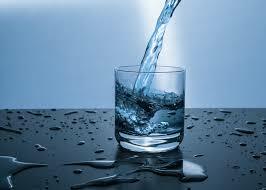 It’s advisable for folks who are dieting to have a full glass of water before having their meals. Now water, as I said before, is obviously crucial for your survival, but even more so for diabetics and type 1 diabetics water is beyond being important! When your blood glucose levels are extremely high, your kidneys just cannot process all that sugar and that’s where water comes in. It can help to flush out the ketones and extreme amounts of sugar from your system. When you have diabetes your body needs more fluid to help your kidneys get rid of the excess sugar through your urine. Water helps to flush out the glucose from your system so it lowers blood sugar and won’t raise it. But having high blood sugar levels will increase your risk of being dehydrated which is a common risk for folks with diabetes mellitus. When your body attempts to remove excess glucose through your urine, you need to hydrate your blood by drinking more water. Now if your body is producing too much urine, it can make you extremely thirsty and your risk of being dehydrated will increase. This is also known as diabetes insipidus. The solution would be to drink more water and the amount should be advised through your physician or practitioner. If drinking water is boring for you, then you can add any different numbers of fruit to it, such as lemon, lime, or orange. In every restaurant I’ve ever been in they always ask if you want lemon in your water or diet drink. Plain water is still the best for you because it contains not one thing that is bad for you. The flavored waters can contain some sugar so it’s not as good a choice. Sparkling water or soda is doable as long as they aren’t sweetened and just are carbonated. When would you guess that the best time is to increase your intake of fluids? If you said when your blood sugar is high, then you’re right! So it’s the fluid (in this case water) that is helping to dilute the sugar that’s in your urine and in your bloodstream. It goes a long way in getting rid of that sugar that can wreak havoc on your body. More water! So, if you take your sugar and the levels are high, then a wise choice would be to have that 8 ounce glass of water because it will aid in your blood vessels from recuperating and help to bring your glucose levels back down to normal or at least lower than they were. * Immune system- Drinking all that water gives you less of a risk of illness. Don’t you want to be healthy all the time? Who wouldn’t? My mom used to say that if you have your health, you have everything. She was absolutely right! Water can help you in in fighting off cancer, the flu, heart attacks, and many other health problems by keeping your immune system in tip top shape! * Being happy- Having ample amounts of water in your body will keep your body working at an optimal level and then you will feel great both inside and out! * No calorie drink- So water is perfect for losing weight in two ways. First off, there are NO calories! The second is to drink 2 eight ounce glasses of water thirty minutes before your meals and it does a wonderful job of suppressing your appetite. This way you will have a tendency to eat less and the result will be weight loss. * Healthy skin- Water does wonders for your skin and since it’s your largest organ and the only one that is visible to everyone, you’ll want it looking shiny and radiant. Water promotes healthier looking skin by improving the flow of blood through your capillaries and keeping your body hydrated. In addition, water moisturizes your skin, aids in replenishing your skin tissues, and increasing the flexibility in your skin. It also helps in treating and preventing acne, scars, and wrinkles especially as you age. It makes your skin look and feel glowing, soft, and fresh and gives you that vibrant appearance. * Metabolism- In order to increase your metabolism, water is responsible for the correct functioning of your enzymes and proteins. It removes dead cells, toxins, and waste products and also distributes nutrients and oxygen to your different body parts. * Kidney stones- You do not want kidney stones-EVER! The pain is unbearable so the best thing you can do for your kidneys and the possibility of kidney stones to NOT develop, is to drink PLENTY of water! Make sure that you get those 6-8 eight ounce glasses every day! Minerals and salts cannot accumulate if you’re drinking enough water because the water dilutes the salt reaching the kidneys and gets removed in your urine. * Energy booster- Drinking more water helps you with focusing, thinking, and concentrating, and alertness. This is due to the fact that your brain is mad up mostly of water. This all results in more energy for you. It’s always great when you feel more energetic! I have found that on many occasions that when I drink more water I do have more energy so for me it works. * Headaches- Dehydration can cause headaches so drinking enough water does help prevent headaches and migraines. Headaches are the pits so I feel why take a chance of getting one because I didn’t have enough water. * Sprains and cramps- If you’re properly lubricated then you have less chance of experiencing a sprain or muscle cramps. I know that when I don’t have enough water I get leg cramps a lot so now I make sure that I am getting enough water no matter what. * Gets rid of toxins- What we need for our bodies is a detoxifier and water is the choice. It will flush out your system by getting rid of the toxins and waste through your urine and sweating. Anyone with a chronic disease such as kidney disease, alcoholism, or diabetes. It should be basically pretty simple. Just drink enough water. Replenish the lost fluids in your body. But other than water you can replenish with broths, ice pops, or Gatorade. There could be other reasons that require medication for treatment. If you’re eating plenty of fruits and vegetables, that will help you to prevent dehydration as well because of the high content of water within them. If you stick with the basic 8 eight ounce glasses of water a day, then dehydration shouldn’t be an issue for the most part. Brain cells- Your brain cells can swell. This can lead to many complications including a respiratory attack and even coma. Lack of potassium- Excess water an deplete your potassium levels. Heart stress- You can put undo stress on your heart because too much water increases the amount of blood being pumped. Liver issues- Water is fine but if the water you’re drinking has iron in it then it can cause problems with your liver. Urination excess- You don’t want to drink too little water but you don’t want to drink too much and be urinating all the time. If your urine is clear, that’s an indication that you’re over drinking. Your urine should have a slight yellow color to it. The bottom line here is that water is crucial for your survival and so important for your healthy and balanced life. It helps you in so many ways but if you have diabetes, you must drink enough water, not too much. Remember the 8-8 daily rule. Eight- eight ounces a day. I will be the first to admit that water was never my favorite drink. Not true anymore. I have to have it cold, but I still love it because of all the benefits it provides. It keeps us alive. But it helps lower your blood sugar too. If You Really Want to Reverse Your Type 2 Diabetes Then Click the Button Below Now! Hello 🙂 Very interesting and informative post. I didn’t know that can be too much water. I have a question. When you say water, must be ONLY water? The coffee we drink, tea, juices cant be taken into account? To be honest, I don’t like water. what can I do about it? So many advantages….i have to start drinking it:) If you didn’t like it how you manage to drink and what makes you now to like it? Well any liquids can be taken into account but water is what you really need. You can try vitamin water or sweeten your water with lemon or honey. I never liked water either but now I can’t get enough of it. I would try and get as much water as possible. It’s just that important for your body. I learned to drink it ice cold. You also get water content from fruits. Your post is very interesting! Water can be so beneficial to the human body, yet we neglect it. To be honest, I hardly drunk one glass of water daily. However the last month, in order to drink more, I started to infuse it with green tea leaves and I’ve seen so much difference in the quantities I consume! Do you have any other tricks in order to consume more? Thank you. We all know how important water is for our survival. But I’m not sure most folks know just how important it is in helping to lowering blood sugar. In addition to all of the benefits that water offers, for diabetics drinking enough water is essential for controlling diabetes and glucose levels. To get more water you can eat many fruits such as cantaloupe, pineapple, strawberries, grapefruit, and watermelon. I hope this helps! Thanks for your input! Hey Anees, Water is the most important resource on the planet. It helps keep us healthy and fights diseases as well. One vital piece of information I want to convey to my readers is how crucial water is to treating diabetes and lowering blood sugar.